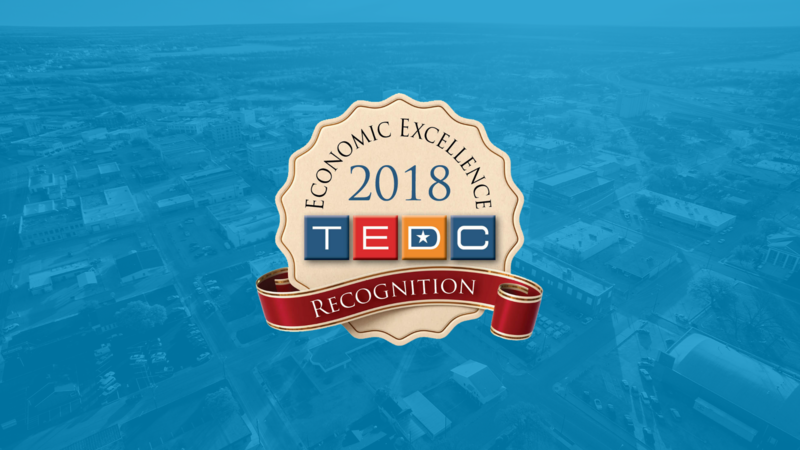 The Brownwood Municipal Development District (BMDD) was one of the recipients of the annual Economic Excellence Recognition from the Texas Economic Development Council (TEDC) for 2018. The awards were presented at a breakfast held Thursday, February 21, 2019, at the TEDC’s Legislative Conference in Austin, Texas. The Economic Excellence Recognition program provides recognition to economic development organizations that meet a desired threshold of professionalism. Recipients qualify for recognition based on training taken by their governing board/council as well as the economic development director and professional staff. Certifications, professional memberships and activities, and organizational effectiveness of the economic development staff also contribute to the standards for qualification. Brownwood’s economic development organization was one of only a few groups recognized through this program and was the only municipal development district to make the list. “To have our BMDD’s efforts acknowledged at a state level is quite an honor,” said the assistant director of economic development Marshal McIntosh, “and to be the only Municipal Development District to receive the recognition among economic development organizations recipients showcases Brownwood’s commitment to growing our economy and improving our community." The BMDD is the economic development arm of the City of Brownwood and is responsible for the overall economic growth of the community through a variety of tools. That effort is very much a team effort, according to BMDD director of economic development Ray Tipton. The Texas Economic Development Council, established in 1961, is an Austin-based, statewide, non-profit professional association, dedicated to the development of economic and employment opportunities in Texas. The TEDC provides information, educational and legislative services to nearly 850 members. Our objective is to support the economic growth of Texas and develop strategies that promote a positive business climate in the state.